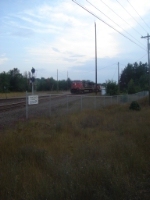 Description: A CN Westbound races past the Durand Depot as it is about to rain. Description: CSX B798 takes CN 327/CSX Q620 to Massena. Description: CSX B798 takes CN 327/CSX Q620 south. Description: CN engine # 5664 shoveing covered hoppers back into the Eagle Mills Yard. Description: Leading an inbound grain train to the yard.